Free Sales Improvement Guide | Don't Tolerate Mediocre Sales Results!! Following a very long drive back from the South West earlier this week I had the opportunity to reflect on some of the most common findings from the last batch of sales audits. Of course, every business is unique, but the issues that stop the sales functions fully thriving are often very similar, here are 15 (from many) common reasons why sales functions are losing momentum, dropping business they should be winning and are unable to scale efficiently. Before you read this it’s worth noting that all of these sales functions are selling in highly competitive markets. All pitching a combination of products and services. All being run by highly competent sales leaders. Everyone is working very hard. And that’s the thing with sales performance. Sometimes the ‘sales norm’ whether that’s just scraping target, missing some deals you should have won, giving away a bit more profit than you wanted…well they’re often things that simply creep up on a super busy sales function. The key is to stop the ‘sales norm’ being acceptable…because the struggle in real and the cost and effort involved in just about keeping your head above water is life draining. Recruiting sales people who have an industry address book, an address book they built when they were ambitious, keen and hungry…the address book is all they have left! Not rewarding the right behaviours and results in the bonus plan. Failing to meet the buyer where the buyer is in their buying journey. Not fully understanding the reasons for the separate elements of the sales process and their value in helping close the deal with a good margin. It’s easy to put your head in the sand when the sales team aren’t performing to their full potential. But at some point, you’ll realise that tolerating any form of mediocrity in the sales function is a slippy slope. Suffering from any one of these is enough, especially when you’re a business in trouble, or a business ambitious for sales growth. The stakes grow considerably higher once you start combining and compounding some of the above. Getting all the elements of sales improvement to work in concert. Now, you can get the support you need in the form of a free step by step guide for sales improvement. For You: A Free Step by Step Sales Improvement Guide. 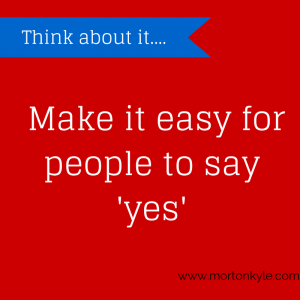 Over the next few weeks I’ll be putting together a step by step free sales improvement guide. You’ll get guided support on how to address each of these issues in your sales team. 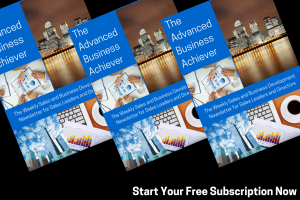 If you’d like a copy, just register below and I’ll send you a copy of the free sales improvement guide directly to your inbox when it’s done. Rest assured, I hate spam mail as much as you do, so all you’ll get is a free copy of the step by step guide to sales improvement, so drop your details below and I’ll do the rest. 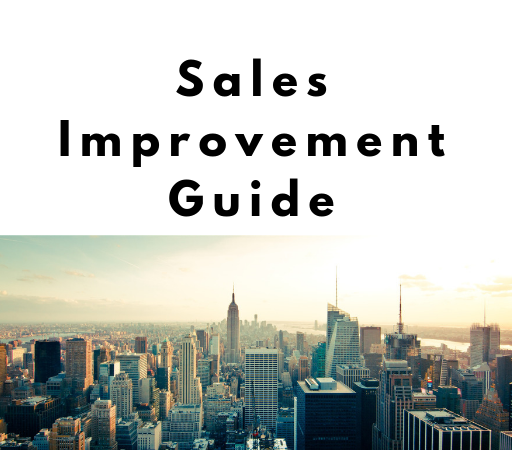 What’s Included in your Free Sales Improvement Guide? How one sales team get their average order value from less than £750 to £3,300 in less than 4 months. How a simple sales process works best and how to build a sales process that works for you, delivering the sales results you want, consistently and predictably. The sales metrics you should use, why you should use these sales metrics, when you should use these sales metrics and why using these sales metrics drives excellent sales habits as well as first class sales results. The key route for recruiting high quality sales staff, how to attract, how to interviews, how to reward, how to keep and how to keep them delivering. How to make sales performance management fun, simple and regular…a cause for celebration and not a chore to be avoided. A comprehensive template on how to coach sales teams to higher levels of sales performance, awareness of what greatness is in their roles, and high level personal accountability using two key self reflection exercises. How to build a crystal clear value proposition that will attract your perfect client and disqualify the low level discount hunters. A self-reflection exercise on how you drill down and find your perfect sales niche…because this is where the magic happens in terms on turning on the sales ATM cash machine. How to structure the sales function to build a high converting sales pipeline. A template for building a cross selling sales engine for your sales team. How to drive great sales habits in the sales team. 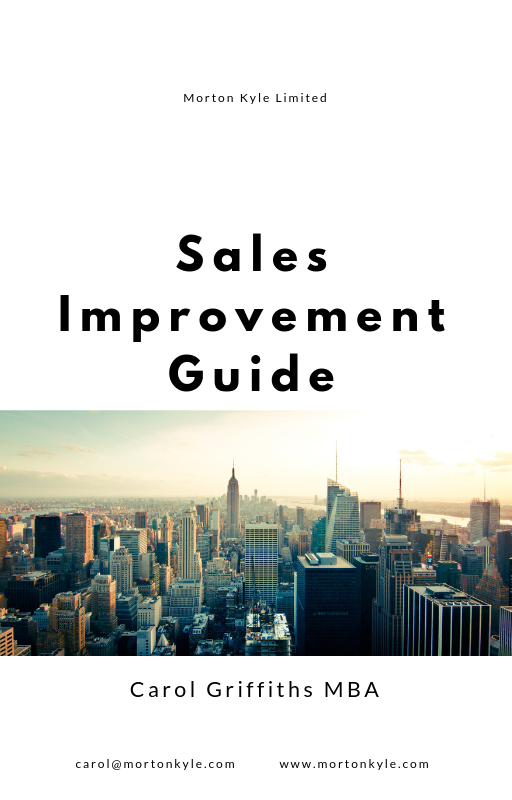 Just enter your details below and as soon as your free sales improvement guide is available, planned release is the end of April 2019. I’ll send your copy directly to your inbox. If you want to share any specific information about your sales challenges, drop details here in confidence. Now, watch your inbox, your sales improvement guide will be with you soon. This entry was posted in Blog, Business Development, Business Planning, Business Strategy, Sales Audit, Sales Coaching, Sales Funnel Creation, Sales Key Performance Indicators, Sales Leadership, Sales Performance Management, Sales Pipeline Management, Sales Recruitment and tagged Free Sales Advice, Free Sales Consult, Free Sales Improvement Guide, Free Sales Training Needs Analysis. Bookmark the permalink.